The Queensland Derby is a Group 1 race for three-year-old stayers traditonally run at Eagle Farm Racecourse on Stradbroke Handicap Day during the Brisbane Winter Racing Carnival. Conducted on a Saturday in early – mid June, the set weights clash is one of three Group 1 features at the meeting along with the JJ Atkins for the two-year-olds and the $1.5 million Group 1 Stradbroke Handicap (1400m), which is Queensland’s richest race. The 2017 & 2018 editions of the Queensland Derby was moved from Eagle Farm to Doomben Racecourse and was contested over 2200m instead of 2400m. Colts and geldings carrying 57kg and fillies 55kg in the Queensland Derby field over 2400m, or 2200m if held at sister track Doomben. The race offers $600,000 in total prize money including $366,000 for the winning connections. A number of lead-up races offer a ballot exemption to the winner into the Queensland Derby including the NZ Derby and Auckland Racing Club Championships Stakes in New Zealand. Back home the winner/s of the Rough Habit Plate, Grand Prix Stakes and the Queensland Oaks for the fillies are also all exempt from Queensland Derby ballot. Of these the key lead-up historically is the Group 3 Grand Prix Stakes (2200m) and the last horse to complete the double was Hawkspur (2013). The next edition of the Queensland Derby runs on Saturday June 8, 2019. Queensland Derby betting opens at pre-field prices weeks ahead of the race date offering juicy futures odds on the likely runners in the race. Three-year-olds that run well in the traditional lead-up races typically dominate the Queensland Derby odds, and more often than not the Grand Prix Stakes winner of the season will start favourite in the Group 1 over the mile and a half. Favourites have a fair record in the Queensland Derby with four saluting for the punters from 2011-2017 including Ruthven (2017), but there is often value further down the markets. The winter’s latest Queensland Derby 2019 betting odds are available now as the field has been released so check out the QLD Derby odds on your favourite staying three-year-olds of the season. 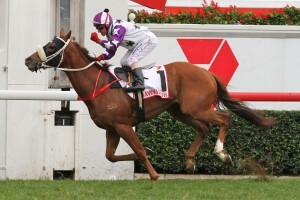 Hawkspur (2013) was the last favourite in Queensland Derby betting to salute for the punters at Eagle Farm. Photo Credit: Daniel Costello. The Queensland Derby field attracts a collection of the season’s most promising staying types. The majority of acceptors are colts and geldings, but fillies sometimes back up out of the Queensland Oaks the weekend prior to take on the boys. The last filly to win the Queensland Derby was Dariana (2010), while in 2017 the only filly in the field Ana Royale ran a brave third. The largest Queensland Derby field had a previous capacity of 20 runners, the last of this size field lining up in 2008 when Riva San won. Now a maximum of 18 starters can take to the track. The smallest Queensland Derby field in recent history saw only eight runners take to the barriers in 1990 when Rough Habit won. Queensland Derby nominations close in early May, four – five weeks before the final field of acceptances is taken and released the Wednesday prior to the race running on the Saturday. The official Queensland Derby 2019 Field & Barriers are now released in full below so bookmark this page to see what three-year-old winter stayers make the line-up on Stradbroke Handicap Day. The early Queensland Derby 2019 nominations close on a Tuesday in early May and the full list of potential runners in the three-years-old winter staying classic will be published right here. The 2018 Queensland Derby Nominations drew 121 hopefuls including the Chris Waller-trained Frank Packer Plate winner Higher Ground who leads early betting for horseman of Winx fame. The Queensland Derby form guide provides punters with all of the must know information like the jockeys, trainers, barriers and lead-up runs of the horses in the field. From 2011 – 2017 four of the seven Queensland Derby winners jumped from a double digit barrier, the distance of the race proving a wide gate is a non-issue results wise. Interstate-trained three-year-olds also have a dominant recent record in the race, so watch the Queensland Derby form guide for Sydney and Melbourne visitors with form in Brisbane that season. A link to our comprehensive Queensland Derby 2019 Form Guide will be provided for punters below the week of the race. Looking for horses that ran top three in a race like the Grand Prix Stakes and keeping an eye on the prices of runners with proven form over at least 2000m are good Queensland Derby tips. From 2006 – 2017 five of the Queensland Derby winners won their lead-up race, so a good tip is looking for a last start winner. Brisbane lead-up races have provided the majority of the Queensland Derby champions in the past 30 years, so another tip is to watch for horses proven at either Doomben or Eagle Farm Racecourse. Our Ladbrokes’ insider Queensland Derby 2019 tips and betting selections on the youngsters to back and sack in the mile and a half classic will be detailed below the week of the race so check back to uncover the value in the Group 1 showdown this season. Single-figure runners have dominated the Queensland Derby results over the past three decades, but recent winners to jump at over $10 for the win include Sonntag (2014) and Magicool (2015) who both saluted at 12/1 prices. Notable recent Queensland Derby winners include Hawkspur (2013), Brambles (2012) and Shootoff (2011). The official 2019 Queensland Derby Results & Finishing Order will be available below once the race takes place on Saturday June 8, 2019.